The building methodology is a mix of post & beam and conventional timber framing. 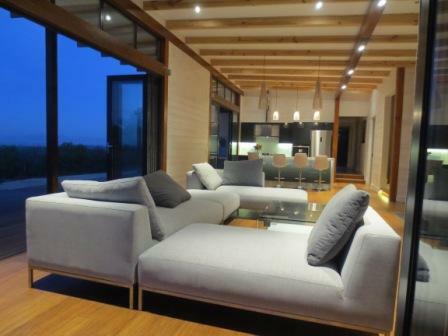 The living area has solid timber elements provide a logical clarity in the structure, with infill panels of either timber frame clad with fibre cement cladding or glazed elements. With a singular plane roof over the most part of the house, differing floor levels provide hierarchy to the internal spaces. Large opening sliding and sliding folding doors make the most of the rural landscape. Situated in the Swartland area of the Western Cape, large overhangs serve to protect from the harsh summer sun. The next phase is the addition of sliding and tilting shutters to the eastern and northern facades.